Since World War I, American bombers were open cockpit, tube, wood and fabric biplanes, but in the early 1930s there were two new aircraft that revolutionized U.S. Army Air Corp. bomber designs. Boeing YB-9. The first USAAC all-metal bomber. The first was Boeing’s all-metal YB-9, (Model 215) a semi-stressed skin fuselage open cockpit monoplane with a span of 76 feet, providing a range of 1,250 miles and a top speed of 173 mph. It could carry two 1,100 lb. bombs. Power was two P&W R-1860 Hornet B radial engines. First flight was in 1931. 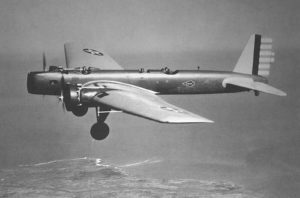 The second was the Glenn L. Martin Company’s M-10 bomber that won the Collier Trophy in 1932 for the most outstanding achievement in American aviation. The medium bomber entered USAAC service in 1934. 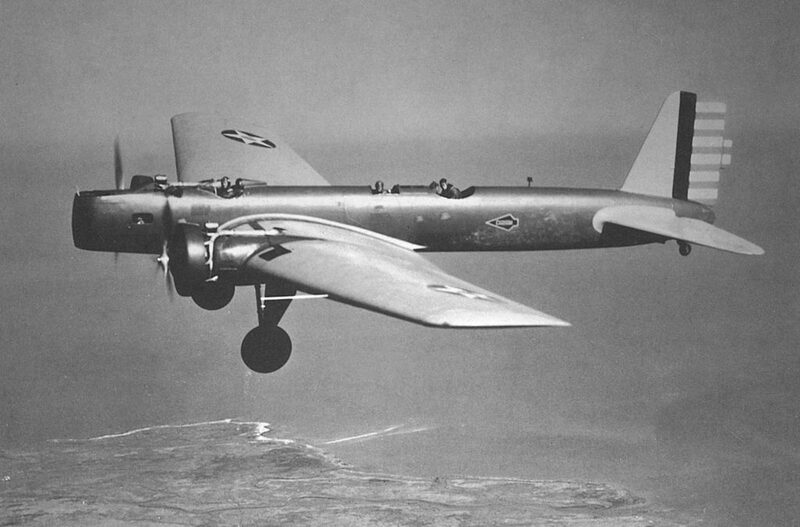 It too, like the Boeing YB-9, was an all-metal monoplane with retractable gear, but the cockpits were enclosed. It also featured rotating enclosed gun turrets, and bomb loads were carried within the fuselage. The twin-engine bomber was powered with Wright R-1820 engines and could carry a 2000 bomb load. Range was 1,400 miles. Top speed 207 mph. The M-10 was a sensational new bomber that proved to be faster than most pursuit planes of that era and set the design standards for most bombers in the future. Martin M-10 featured rotating enclosed gun turrets. In early 1934 the USAAC requested a design for a heavy long range, high altitude bomber and Boeing met the challenge with the Model 299—(B-17 Flying Fortress) a bomber, the prototype powered with four 750 hp Pratt & Whitney R-1690-E Hornet radial engines. 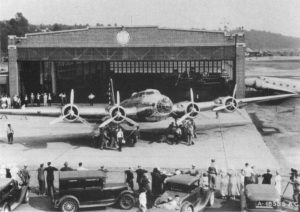 First flight was July 28, 1935. The huge 103 foot 6 inch wingspan of the Boeing exceeded, by far, the original specs for load, range, speed, ceiling requirements as well as mechanical maintenance and service efficiency. The flight to South America in 1938 was just another demonstration by the military to publicize to the world the outstanding performance of their new bomber. Lt. Col. Robert Olds who commanded the six plane Flying Fortress flight to South America was also in command of one of the three Flying Fortresses flying through torrential rain and hail that intercepted the Italian passenger liner “Rex” 620 nautical miles off the Atlantic coast in May of 1938, proving the effectiveness of pin-point navigating over long distances. Navigator for this flight was Lt. Curtis LeMay who would later become a four star General and command SAC . He was also chief navigator on the South American Good Will flight. Factory roll-out and first flight of Boeing’s fantastic new four engine long range bomber July 28, 1935. A total of 12,731 Flying Fortresses would eventually be built throughout World War II and were recognized as the USAAC’s premier heavy bomber. Lt. Col. Robert Olds was born in 1896. He was a pioneer aviator in the Army Air Corp and an early advocate of strategic air power. He commanded the 2nd Bomb Group that received the first 12 operational B-17 Flying Fortresses, developing operating procedures and tactics and conducting numerous speed and distance flights with the B-17. During World War II he organized the Ferry Command and was appointed commander of several Bomber Commands. He reached the rank of Major General but died in 1943 at the age of 46. 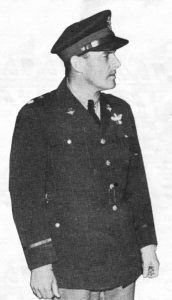 Major General Robert Olds was the father of Brigadier General Robin Olds who was an all American football player at West Point, a multi-ace fighter pilot in World War II with 13 German planes shot down. In the Vietnam war he flew 152 combat missions in F-4C Phantoms and shot down four Mig jets. General Robin died in 2007 at the age of 84. The following article written by Lt. Col. Robert Olds is reprinted from the August 1938 issue of POPULAR AVIATION. We proudly present this scoop to our readers. The author, one of the Army’s aces, led this amazing flight and has written his version of that adventure exclusively for POPULAR AVIATION. By Lieutenant Colonel Robert Olds—Awarded the Distinguished Flying Cross as commander of the famous flight. If the turmoil and strife of international uncertainty has not jaded our nerves too much, come on up in the control cabin of Flying Fortress Flagship No. 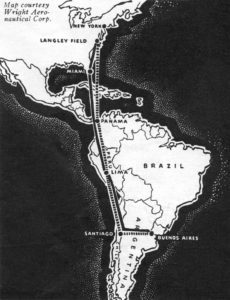 10, and dash with us down to Buenos Aires and back, leaving guns and bombs far behind—out of our minds—and with new, thrilling adventure just over the horizon, let’s open the throttles. … it is 12:30 p.m., February 7, 1938. We are at 19,000 ft. somewhere in the vicinity of Mount Shasta, California, over solid overcast beneath which violent, unseasonable storms have been raging for some ten days. The radio crackles. In cryptic, typical form the message reads: “Return to Langley Field with the least practical delay.” Our mission to Seattle thus terminated abruptly without previous warning. At midnight, February 8, we land at Langley Field, agog with curiosity. 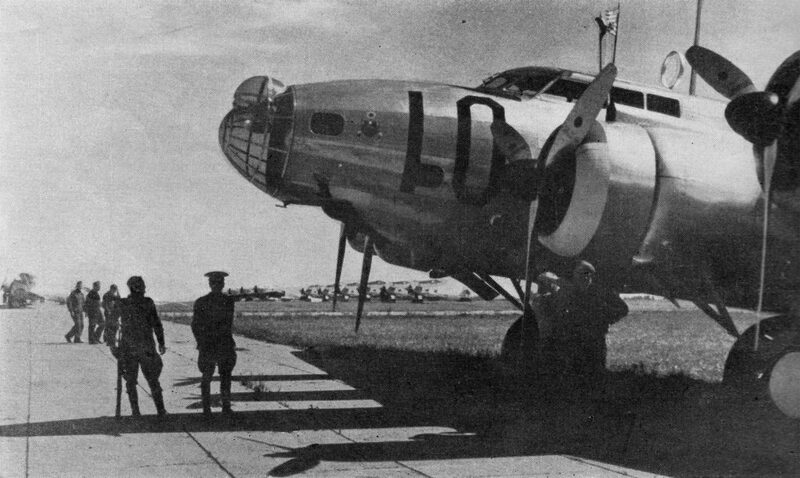 Within a few moments we learn that the Second Bombardment Group has been designated to accomplish a Good Will flight to Buenos Aires, Argentina, which will include visits of courtesy to the Republics of Argentina, Chile and Peru, and participation in the inauguration of the President-elect Ortiz of Argentina. We are to leave the United States February 17, and if possible arrive in Buenos Aries February 18. Lt. Col. Robert Olds commander of the South American Good Will flight. At long last the chance really has come to go places in a big way. To put to a convincing test the mettle of our sleek Flying Fortress, greyhound of military aviation. The ships we have groomed day and night during the past 12 months to meet any peace or air defense emergency arising. We are elated and plunge into a thousand last minute preparations, including the procurement of maps, analyses of weather, spotting gasoline and oil, passports from State Department, communications plans, etc, etc. On the morning of February 15, we are fully loaded and leave at leisure for Miami, Florida, the officially designated departure point. Flagship No.10 is piloted by myself, as group commander, Major Edwin R. McReynolds, a veteran of many thousands of hours in the air, is deputy airplane commander and occupies the engineer-pilot’s seat. He and I have been flying No. 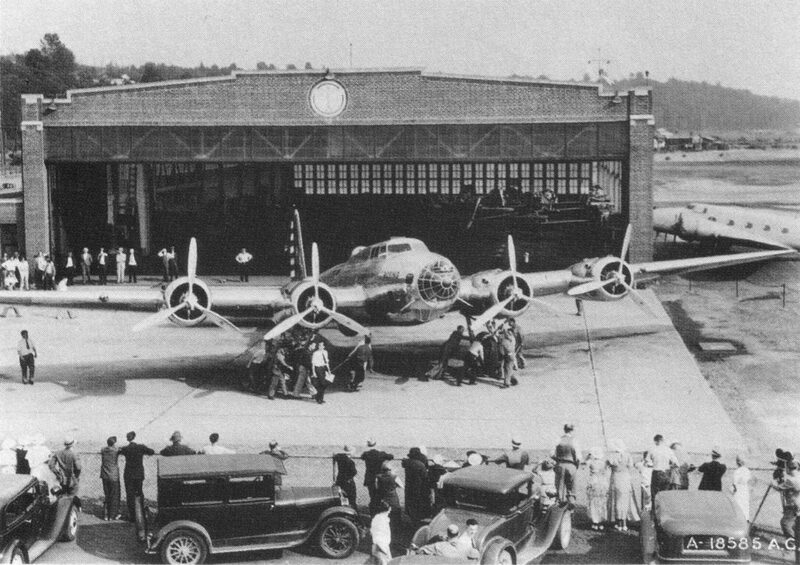 10 together since it left the final assembly line in Seattle, Washington, in May, 1937. The same combination hurtled back and forth from coast to coast in record time last January on a practice cruise; practice for anything to follow. It now looks as though that coast-to-coast cruise is to pay dividends. Lt. John W. Egan, the group navigator, is buried in charts, octants, dividers, computers, and other paraphernalia our aerial navigators bring into play to keep us on a true course. In the radio office, Capt. Robert B. Williams, the group operations officer, is checking routes, time, distances to be flown, weather, position reports, rosters, loading data, primary and alternate airdromes—and standing by to relieve either the first or engineering pilot. Lt. Edwin L. Tucker, the group communications officer, is testing the plan for radio contacts we have issued prior to departure. “Everything working O.K.,” he reports with a satisfied grin. Sergeant Boutty and Private Jester, the chief mechanic and his first assistant, who have also become a living part of No. 10 since it left the factory, are beaming all over. Even with our full load we had used less than two thirds of the runway at Langley Field on our take-off and all four engines are now purring their deep throated eagerness to be on the way to South America. Privates Walsh and Trout, the chief and first-assistant radio operators, are “working” first Langley Field and then the advance ground station at Chapman Field near Miami. Their work is entirely in radio code—it reaches out much farther than voice and adheres more sharply to radio frequency used. These two have a long grind of sleepless dots and dashes ahead. They should be relaxing now, but enthusiasm is too high for that. Position reports are exchanged. No. 52 has forged ahead. “Chuck” must have slipped a little higher powered gasoline into one of its tanks! An hour later on the next position report No. 52 is back in his original position in column, due to his reduced cruising speed. We are met at 10,000 feet over Fort Lauderdale, Florida, by Major George W. Goddard, ace photographer of the Army Air Corps who always gets results but whose photographic energy brings dismay to many others with so much else to do and so little time to do it. We are in radio voice contact with Major Goddard and try to oblige by forming first in an echelon of squadrons then an echelon of individual planes, while heading for Miami over broken cloud background—the prayer of all aerial photographers. We nearly fell out of our seats when from somewhere out of the sky Goddard’s voice announced that he was through and had gotten what he wanted even before we reached Miami. We had visions of landing at Miami via Key West to satisfy his photographic appetite. But good old Goddard must have sensed how anxious we were to land and spruce up for the big hop to Lima, Peru. We have two air mattresses and sleeping bags in each ship. The chief mechanics and their first assistants remain aboard overnight while all others proceed to a hotel in downtown Miami. Interest in the flight apparently is increasing. Reporters, news photographers, delegations. Bell boys, telephone calls, friends. That full night’s rest shrinks to four hours. Up early on the 16 th to inspect the fully serviced planes. Everything is in readiness. We dash to the beach to relax an hour or two in the sand and surf. It works and is restful. However, the scheduled nap later on in the hotel gives way to an assembly at 9 p.m. for the following orders. It is now 12:30 a. m., February 17, 1938. Major McReynolds, my engineer-pilot in No. 10 has completed his inspection; all engines are running; the ship is ready to go. Lieutenant Egan, the group navigator, reports all in readiness. Lieutenant Tucker has tested our radio and is in communication with the temporary Air Corps radio ground station at Chapman Field, Florida. We call the roll over the interphone. Everyone is aboard and at duty stations. We shift over to our command short-wave radio to see if the other planes are ready to go. Olds to all planes: “Follow me at three-minute intervals. Automatically, each airplane commander and his engineer-pilot now shift to interphone (the telephone system connecting all persons aboard) and go over the check list which insures that no important item is overlooked before we taxi out to take-off position. Let’s peep over Major McReynolds shoulder during this check list formality. It may disclose one of the reasons why Army methods have obtained eminently successful results in thousands of hours of flying operations with our Flying Fortresses. We use a six-by-eight card with each item properly printed and numbered in logical sequence. Each pilot and co-pilot call off, check visually and physically every item listed to be doubly certain that nothing has been overlooked to insure the safe operation of the plane. We are in the air at 12:45 a.m., February 17, 1938. Destination: Buenos Aires. First stop: Lima, Peru. Fleecy, scattered cumulus clouds at altitudes from 4,000 to 10,000 feet cast a faint shadow over Miami and the Florida Keys in the moonlight. All ships are in the air and have reported “On course.” Although out of visual range of each other, the report assures us that the individual navigation of each plane is accurate and that all planes are where they should be in supporting distance of each other. Within a surprisingly short time, we broadcast from No. 10: “Over the north shore of Cuba.” Each airplane commander in the group repeats the same information as his plane passes over the shoreline. South of Cuba the cumulus cloud formations rear their heads to 14,000 or 15,000 feet in altitude. We are fairly heavily loaded, and avoid these vertical castles in the air as far as possible only because of the turbulence we know that lies within such nocturnal grandeur. Our navigators are so absorbed in their problems that each slight deviation from our true course to avoid these turbulent conditions produces a groan from the chart room. There are an amazing number of men, preferring to take the bumps to any deviation from course. At last we humor Lieutenant Egan and penetrate a relatively small cumulus head. After the maps and a few instruments are gathered up from the floor of the airplane on emerging from this cumulus formation, we hear no further groans from his direction during the remainder of the trip. Cuba now lies astern. We are over the Caribbean. As a result of our three minute interval between individual airplanes at the take-off, we are spaced approximately 10 miles apart. All airplanes are equipped with navigation instruments adequate to meet our requirements for both celestial and dead-reckoning navigation over land, sea or fog, and each of the six navigators must solve his individual problem and arrive at destination on course and on schedule. Hourly position reports are being transmitted to Washington and Langley Field where the progress of our flight is being plotted accurately as long as we are in the air. It is comforting to know that higher authorities are also on 24-hour duty ready to spring into action should an emergency arise. The first gray streaks of dawn should find us over Panama. Clouds are thickening, and the surface of the sea is becoming somewhat obscured by haze. We are at 14,000 feet consuming coffee and sandwiches. A short distance ahead the cloud formations brightly illuminated in the moonlight appear ghostlike in their resemblance to high mountain ranges. The sky brightens with the coming sun. A small hole in the cloud formation appears downward and to the left of the nose of our flagship. We see Gatun Lake in the Panama Canal Zone, are within five miles of our first navigation check point, and have passed over within two minutes of Lieutenant Egan’s estimated time of arrival. Our planes are comfortable, engines and accessories are functioning smoothly, and we could have no greater confidence in the efficiency of our crews. So when we learn from Panama that severe tropical disturbances are raging along the coasts of Colombia and Ecuador, we fly on toward our objective, confident that our equipment can return us to Panama if reported conditions are impenetrable. As we leave Point Mala behind it is broad daylight and, for the time being, the weather is clear. This gives us an excellent opportunity to take a double drift to recheck our actual ground speed. Within a couple of hours, the weather thickens, and we are at 12,000 feet above solid overcasts, which rise with increasing rapidity as we near the equator. Weather reports from Buenaventur, Columbia, Tunaco, Columbia and Guayaquil, Ecuador, are not encouraging. Low ceilings, low visibility and heavy rains have been reported since daylight. Each member of our crew has been provided individual oxygen equipment. We now put it to use. “Eight zero; 16,000 feet. Now between layers. Appears better toward seaward. All ships acknowledge and execute change in course as ordered. It is the rainy season in this equatorial area and we expected anything but fair weather. However we were not prepared to admit that any storm could rise vertically at a higher rate of speed than we could climb. We lived and learned, hence our maneuver to seaward to circumnavigate the center of the disturbance. If you could ever inherit a million dollars that news would be no more welcome than the Talara weather report was to us at this time. Although some 500 miles to the south of our present position, it gave us an out and that was what we need most to continue on the Lima. Then follows an uneventful, though interesting portion of this leg of the flight across the coastal desert areas of Peru to an assembly of the six planes over Point Salinas, from whence we proceed to Lima and arrive over the town at 3:20 p.m. For the next 40 minutes we circle and maneuver in formation finally landing on the Limatambo airport at 4:00 p.m. Even the grouchiest pessimist had to send up a rousing cheer for the remarkable achievement of the men who participated in this outstanding flight. Besides Lieutenant-Colonel Olds, 48 others made the flight. Before we come to rest the American and Peruvian flags are run up side by side over the control cabin hatch of each airplane. Huge throngs cheer a lusty greeting from the spacious airport enclosures adjoining the Panagra airway station. Uniformed attendants flag us to parking spaces. The Peruvian army is on hand to guard our ships during our brief visit for fuel and food. The American ambassador, Mr. Steinhardt, his staff, and many high officials of the Peruvian government are on hand to greet us as we set foot aground. Immediately following these pleasant formalities we conduct the usual pre-flight inspection of aircraft, and start refueling for the next leg of our trip.. Although we have not slept for 36 hours, there is little evidence of fatigue. A delicious supper is served in the airport café, after which we call a conference of all airplane crews and study weather reports for the remainder of the journey. It us now 10 p.m. February 17. All planes are refueled, although the weather is not particularly favorable. Reports indicate low fog banks which we can see hovering closely to the south in the path of our take-off. They also indicate a solid overcast above the fog extending probably to 8,000 to 10,000 feet in altitude. An uninviting hill about eight miles in length and 1,200 feet high is located most inconveniently about four miles to the south of our airport directly in line of flight. The Andes rise to many thousands of feet to the left of our course. All in all, conditions are not too favorable for the take-off unless equipment and personnel are in the pink of condition. of synchronization, in the functioning of the particular unit. Efforts to remedy the difficulty have not been completed up to this time, therefore Major Meloy and his crew are directed to continue work on the faulty governor, leave Lima at daylight, February 18, and rejoin the group at Buenos Aires before dark. “Stations—10:30. Take-off 10:50, three minute intervals.” We are loaded as usual to full capacity, but clear the temporary road lights at the south end of the airdrome by a good 100 feet, followed by a 30 deg turn to the right to head out to the sea and avoid the young mountain down to the left. On instruments for a few brief seconds and than a steady climb to 4,000 feet where we enter the overcast. Each succeeding plane reports “O.K.” as the airdrome is cleared. My ship breaks through on top of the overcast at 7,000 feet, and relays that information to the succeeding planes. In a comparatively few minutes, we sight a small light directly over the nose of the flagship. It grows gradually into Autofagasta. Drowsy relief. “Sergeant Boutty, please send a thermos jug of coffee up to the control cabin.” Relief crews now take over the next two hours. Fog is rolling in over the coastline, while the snow-covered peaks of the Andes shine in the moonlight to our left. Our maps for the most part are coastal charts which show little or no detail inshore. From Valparasiso on the Buenos Aires, however , we have sectional charts which are somewhat better. A golden glow appears to the east which silhouettes all its exquisite grandeur the white mantled majesty of the Andes. To view this masterpiece of nature from an altitude of 15,000 feet in the crisp air of a Chilean early morning creates and indelible impression which time can never erase. We pass between San Felipe, Chile, and Mendoza, Argentina, is clear and unlimited. We cross, between snow capped peaks that touch the heavens at 23,000, at a flying altitude of about 18,000 feet and directly over the world famous statue of the Christus on the Argentine-Chilean border. From Mendoza to Villa Mercedes we pass over or circumnavigate countless cumulus heads indicating at this time the incubation of thunder storms to follow over the Pampas. We pass out of the cloud area at Villa Mercedes, and penetrate a fairly severe dust storm until Junin is reached. “Olds calling all planes. Assemble at 4,000 feet over Mercedes,, 40 miles west of Buenos Aires.” It takes less than 12 minutes to complete the assembly over Mercedes of the five airplanes, each of which has just flown over 2,250 miles from Lima, Peru, without having seen one another during any part of the journey. We are over Buenos Aires at 11:05 a.m. February 18, and maneuver in formation until our landing is accomplished at the El Palomar airdrome at 11:30 a.m. Our first impression of Buenos Aires is unforgettable. Its many beautiful buildings, clearly visible from the air, stretching over a vast area dotted with parks rich in foliage, lined with broad streets, and studded with many circles. The broad Parana river is in the distance with a neatly-planned city waterfront in which countless ocean liners are docked. We are absorbed in the beauty of Buenos Aires from the air, but much to our consternation we notice the unfamiliar left hand automobile traffic weaving along the streets and highways. This left hand traffic is to give us many thrills during our stay in Buenos Aires, of which at present we are totally unaware. Argentine Air Force is our host in the Officers Club at El Palomar for refreshments. We are guests of the government at the Alvar Palace hotel. Our mechanics and radio operators are guests of the Argentine Air Force at El Palomar. That evening word is received that Major Meloy in ship No. 51 left Lima at daylight to rejoin the group. He is due in shortly before dark. Major Eugenio Cormach Lynch of the Argentine Air Force, who has been detailed to me as adjutant-aide during our visit to Buenos Aires, is now on the telephone. The El Palomar airdrome has called and reports a 65 mile-an-hour gale with considerable dust, following closely by a violent thunderstorm. Our communications from air to ground and vice versa are with Panagra. Their field is within 15 miles of El Palomar. We telephone Panagra and select certain alternate destinations for Major Meloy where the weather is less severe. He is kept informed constantly of conditions at Buenos Aires. Upon his arrival the full force of the disturbance has not been spent, but fortunately it has not extended more than 30 miles west of Buenos Aires. After an hour, he lands at El Palomar in a severe rain, but without difficulty, and rejoins his group before dark of the second day out of Miami, Florida. In doing so he has accomplished a brilliant flight at high altitude, diagonally across the heart of the Andes from Lima to Buenos Aires. We wanted our record complete and left it up to Vince Meloy. He came through as expected. In the early part of the evening I, as group commander, am escorted by the American ambassador to the home of President-elect Ortiz, where a letter dated February 16 from the President of the United States is presented on February 18 to the President-elect of the Republic of Argentina. On February 20 we take to the air with our six Flying Fortresses and once again are over Buenos Aires leading a large formation of airplanes from the Argentine Air Force over the inaugural parade in honor of their new president. As we take stations at 6:45 a.m., E.S.T., February 22, preparatory to the relative short flight to Santiago, Chile, we are truly sorry to leave so many new-found friends so soon. Their cordiality and hospitality has been sincere. We have felt individually and collectively that the attitude of the people of Argentina has reflected through us a genuine affection for the people of the United States. As individuals we can only say that nothing would give us greater pleasure than to be able at some future date to reciprocate their hospitality. An unnoticed, lightly reinforced manhole cover on the edge of the concrete ramp in front of the hangars at El Palomar has caved in slightly under the weight of the right wheel of No. 82. Heavy jacks are not immediately available. This will delay the take-off of Captain Smith, who is directed to rejoin the group at Santiago as soon as possible. We leave at 7:05 a.m. on a beautiful, clear day with unlimited visibility, and are thus afforded an opportunity to gain our first unobstructed view of the verdant country to the west of Buenos Aires and later the famed pampas. Within three hours we can see the snow-capped peaks in the vicinity of Mendoza, which rear upwards to 23,000 feet. Our five planes assemble over San Felipe, proceed to Santiago and maneuver until we land at noon, February 22. The American charge d’affaires and Mrs. Frost, his staff and high officials of the Chilean government are at the Los Cerillos airport to greet us as we land. As had been the case of Buenos Aires, the American embassy take direct charge of our official and social schedule which is strictly adhered to. Captain Smith in No. 82 rejoins the group before dark. As we prepare to take-off for Lima at 7:45 a.m., February 23, minor trouble develops in one of the engine starters on No. 82. Captain Smith reports over the radio it will take approximately two hours to remedy his difficulty. He is directed to clear Santiago as soon as possible and be prepared to remain overnight at Arica, Chile, in view of the fact that night landing facilities are not available at Limatambo airport in Lima. We clear at 7:45 a.m. with good weather prevailing in the immediate vicinity of Santiago. Within 25 miles to the north, however, the fog covers the sea as far west as the horizon, and is poking its eerie fingers will into the valleys of the Andes. We sight Arica in mid-afternoon through a clearing in the overcast, and are then back over a cloud-covered sea almost immediately thereafter, with considerable static crackling in our ears caused by a continuous line of storms raging over the Andes to or right. Weather at our destination is unsettled, but we have sufficient range to proceed on beyond to the arid areas of Peru well to the north of Lima in case of landing difficulties at our scheduled destination. The route covered on the record-breaking flight from Langley Field to Buenos Aires and return. At a point some 150 miles south of Pisco, Peru, the weather begins to thicken. It looks as though we may have to go underneath to get to Lima, as at no point south of Miami have we had the advantages of radio range stations such as permit our aircraft in the United States to let down “on instruments” through overcasts at destinations. Accordingly, we drop down from 10,000 feet to about 200 and continue for some 15 or 20 minutes flying contact along the shoreline, where the cliffs are half bared in fog and clouds. This is not too comfortable, so we gain altitude to 6000 feet and continue between layers until our calculations indicated that we should be 10 miles off the de Paracas peninsula immediately south west of Pisco. We then change courses for Lima, and arrive on schedule with a good ceiling of 4,000 or 5,000 feet. Our assembly is accomplished over the city of Lima at 4:45 followed by landing at 5:10 p.m., February 23. Our same friends greet us at Lima on our return and, as we had found in both Santiago and Buenos Aries, the hospitality and courteous considerations to all personnel of the Good Will Flight leaves absolutely nothing to be desired. Captain Smith in No. 82 reaches Arica before dark and rejoins the group at noon, February 24, at Lima where all airplanes are being thoroughly inspected and refueled for the return flight to Panama. 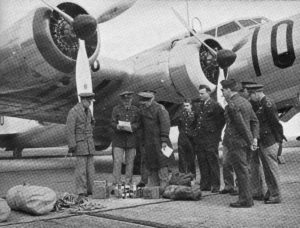 At 6:00 a.m. February 25, our six Good Will Flying Fortresses leave Lima for Panama. We encounter a solid overcast at 3,000 feet, breakthrough on top at 7,000, then on up to 12,000 where we set course for Panama. The clouds remain solid beneath us, although we are able to take constant observation of the sun. A few small breaks in the overcast appear ahead, and as we pass over, we recognize Talara. None of us know what Talara looks like on the ground, but from the air it is truly a friendly port, an invaluable checkpoint on both our southbound and northbound flights. As if accomplishing its mission to our complete satisfaction, Talara again becomes obscured by additional overcasts we encounter to the north, and we feel as though we are saying goodbye to a good, loyal friend in need. Later on we find a limited area of scattered clouds over Point Elena on the coastline of Ecuador, due west of Guayaquil. This provides another good check point to confirm our calculated ground speed. Tumaco, Buenaventura and Salano, three Panagra stations on the west coast of Colombia, now report tropical rains, but Panama is open. We climb to 16,000 feet over top of the persistent equatorial overcast and glide along smoothly into Albrook Field in the Panama Canal Zone, where many old friends in the Army and Navy are on hand to greet us. We remain at Albrook Field over night to permit many of our brother officers an opportunity to inspect the Flying Fortresses on their first visit to Panama. The author (second from left) discusses supplies for the trip; with Major-General Frank M. Andrews, chief of the GHQ Air Force. The author flew the ship in the picture. At 8:05 a.m., February 26, we are hardly in the air before landing gears are lowered to come to rest on France Field on the Atlantic side of the Canal Zone where mechanics will assist us in conducting a routine 40-hour inspection, and the refueling of our planes for the last leg back home. We have planned a return trip by easy stages and shall probably spend the night of February 27 in Miami our starting point. We learn, however, we are due to participate in Wing Maneuvers in Florida in the very near future and our vacation to South America is practically over. We therefore order full service and stations at 5:30 a.m., February 27. We are to link by direct nonstop flight the Panama Canal Zone with the key air base of the GHQ Air Force, Langley Field, Virginia. It is 6:10 a.m., February 27. The wheels of Flagship No. 10 are well over the lights at the end of the north-south runway at France Field. We are told to expect 25 to 30-mile head winds up to 12,000 feet. Above that altitude these winds should diminish slightly. All planes are off, loaded to full capacity as usual. No one uses more than two-thirds of the available runway to get into the air. We climb to 13,000 feet, hit the south coast of Cuba directly on the nose at a point halfway between Trinidad and Cienfuegos. Then the city of Miami affords our first glimpse of Florida. Continuing on course, we proceed to a point 375 nautical miles north of Miami well off-shore in order to give our navigators a final opportunity to take a series of running shots on the sun. These shots check accurately with their dead reckoning navigation which guides us on our new course to the exact spot we expected to reach for our first land contact near Charleston, South Carolina. As had been our practice in accomplishing all assemblies, the flagship circles to the left, all others to the right. If the flagship is delayed time is not lost attempting to assemble on the wrong airplane. All six ships are in formation within 10 minutes, after the first plane arrives over Norfolk, this being the first time we had seen one another since the take-off at France Field although in no time were we unable to maintain voice communication between planes. We maneuver in formation over Langley Field for nearly 30 minutes and land at 5:00 p.m., February 27, having traveled over 12,000 miles in less than seven flying days. As we taxi in, in excellent health and spirit, in the best airplanes of their kind that have ever been built, and with engines that have purred sweetly and continuously without a single miss, we find the entire garrison on hand to meet us. It does not seem real. It is one of those experiences we have each dreamed of for many years. Lieutenant-Colonel Olds’ flagship, Flying Fortress No. 10, frames airplanes of the Argentine air force on the airport at Buenos Aires. On each stop, the Boeings flew the hosts’ and the American flags. We are now lined up in front of the flagship. The commander of the GHQ Air Force is reading the latest congratulatory telegrams from the Secretary of War, the Chief of Staff, and the Chief of the Air Corps, whose confidence in our Army from the very start made the Good Will Flight a possibility, and whose intimate interest in our progress greeted us at every stop. We are all a little deaf from the constant throb of the engines, and the higher altitudes at which we have been flying, and are missing a few words of the messages, but we’ll never forget the gratified smile of greeting we received from the man whose continued radio messages of encouragement throughout the entire trip had kept our spirits keyed to the highest pitch and whose personal piloting has been an incalculable inspiration to all aviators under his command: Major General Frank M. Andrews. And so to bed, for there’s more work to be done tomorrow.